For many my age, the "M" in "MTV" stands for "Martha." 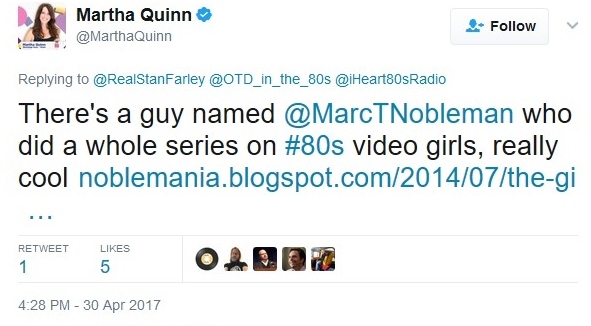 As in original MTV VJ Martha Quinn. Thanks, Marc. You just made my day. 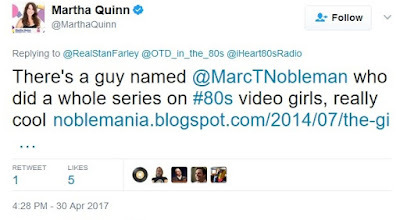 FWIW, you ain't alone when it comes to Martha Quinn. I was crushing on her, too, back in the day. Excellent. I still love my 80s video girls--especially my all-time favorite Mak Gilchrist (Addicted to Love). Here's one for you. The girl in the Dave Edmunds video "Slipping Away." She's been slipping away for 35 years.